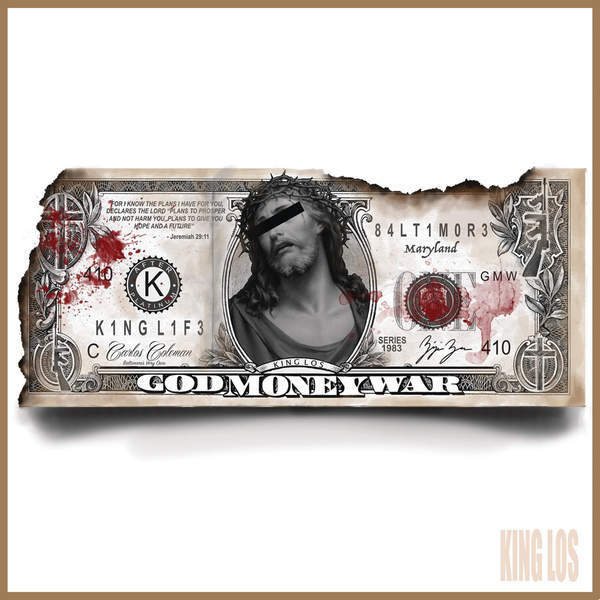 The artist you all might know as King Los started off years ago as just plain "Los" here in Baltimore over a decade ago back when I was running around with my friends trying to get on as well. It's interesting to see some of the national accolades after those years of local labels and even the failed stint Los had on the original cast of Making the Band and then his subsequent signing to Bad Boy after all of that as an artist and then getting dropped and bounced around. So there is a lot of work and years in this new album, "God, Money, and War". The album starts off with "War" which features Marsha Ambrosius. The first half of the song is plain normal intro type music, but the second half gives that first glimpse of his lyricism to those who are unfamiliar with his work. Especially when he moves into his more rapid flow which is better than his slower one and he still maintains his lyrics. This is also evident on "Ghetto Boy" where he also channels some different sounds and techniques, like rock drums and distorted vocals on a pre-chorus of sorts. This song is unconventional in its composition but it works as an overall audio product. "Black Blood" featuring Isaiah Rashad and Kent Jamz as they go into a song about how the drama and trauma of the streets has raised them up from the streets a la black roses from the concrete. The song itself isn't for me but i appreciate the concept. The title track "God, Money, War" is dedicated to the streets and Los also adds in the overall political element. Once again the track shines when he switches up the flow. "Blame it on the Money" samples Masta Ace to my ears with some heavy synths and bass. the beat is crazy for sure. "Glory to the Lord" with R, kelly came out a little while ago but it's not that great to me. It sounds to Big Sean type for me. "Slave" with Eskeerdo is only average to me, when Los is rapping fast he's rocking, but when he isn't it reminds me of a Shy Glizzy type of song and that's beneath Los. he song itself reminds me of Wale's chain music in the theme though. "King" with Puffy and Mark Battles is a throwback to the time when Los would just rap and go off, 90's style. At the end of the day I saw some crazy initial reactions of the album but thats fine, he can rap and with todays industry being so watered down it can cause those over reactions. To me the album is solid, maybe just above today's mix tape quality for the most part with some stand out songs and varied production that is lively and fits Los' style and voice. Anyone who knows him, knows Los can spit the question is can he put together a full album and for the most part he did but for me I needed just a little bit more to elevate his debut to someone like B.O.B. or Wale, but he definitely has the potential to step his game up.